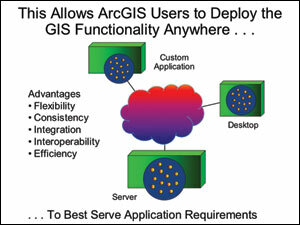 "Serving Our World With GIS"
What Happens After ArcGIS 9? In July 2003 approximately 12,000 GIS professionals met in San Diego, California, at our 23rd Annual Esri International User Conference. When we initiated this annual gathering back in 1981, and it was attended by just 18 people at the Esri office in Redlands, California, we had no idea it would grow and evolve into such a major eventnow the largest annual GIS event in the world. It provides many opportunities for GIS professionals from many fields and more than 135 countries to share and learn about GIS technology, applications, and organizational implementation approaches. Clearly, the growth and evolution of this conference is a reflection of not only the many positive developments in GIS technology but also the building of thousands of human relationships and diverse human networks within the GIS community during these same years. My experience with people is that, beyond everything else, they strive to make a differenceusually by performing what we call service. Thus, our theme this year"GIS . . . Serving Our World"acknowledges both this human value of GIS professionals serving the world and the GIS technology that is moving toward a serving environment. These two together are exciting to me because they are about providing better ways to manage the world we live in. 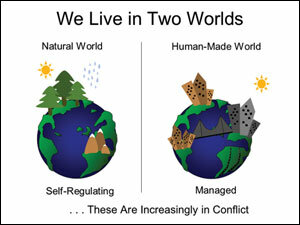 We live in two worlds: a natural, self-regulating, and evolving planet and a human-made world that is increasingly being managed. 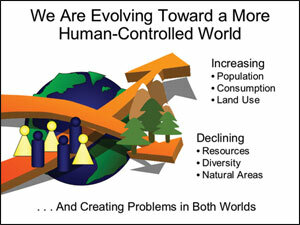 Because of expanding population, consumption, and land use, many of our natural resources are declining, which is creating problems for both worlds. To deal with these problems, humans need to take more responsibility for the evolution of our planetnot just our piece, geographically or thematically, but the whole thing. We need better ways to account for things in a global context. Historically, our species has learned to abstract knowledge and share it. This has allowed us to learn from each other's experiences. We explain our human experience and collective understanding with these abstractionssummations of the larger body of knowledge. Abstractions, including text, hieroglyphics, language, mathematics, drawings, and maps, record and communicate our culture and civilization from generation to generation. Now, as things are becoming more digital, we've begun to capture everything we know and make it available to anyone anywhere, a so-called Internet culture. 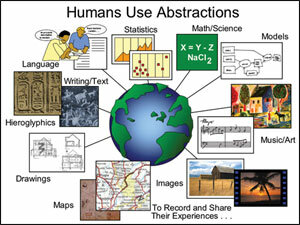 In other words, our abstractions are becoming digitally enabled. At the same time, the systems developed by GIS professionals are helping us better represent, understand, manage, and communicate our earth as a system. Geography provides people with a framework and language for organizing the world. GIS provides a comparatively new and rapidly growing human abstraction. 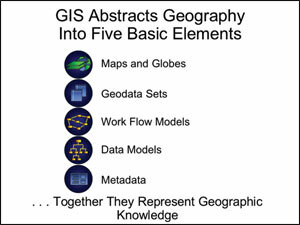 GIS abstracts the centuries-old science of geography into five basic elements representing geographic knowledge: maps and globes, geodata sets, work flow models, data models, and metadata. Together these five abstractions represent what we might call geographic knowledge. 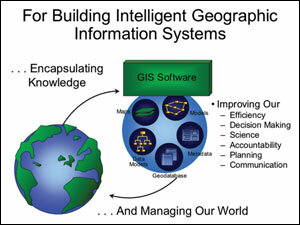 These five elements plus GIS software are the building blocks for what I think of as "intelligent geographic information systems." They are a kind of digital version of geography. These systems encapsulate our knowledge and provide a foundation to help us serve our world (i.e., improve efficiencies, decision making, planning, geographic accountability, science-based plans, and communication). Intelligent GIS will help people document the knowledge of those who have experienced and established standardized work flows and models of geographic processes. It will provide a means of creating knowledge repositories to publish data and data models for others to use. This vastly improved technology for organizing our geographic knowledge and experience will improve the way the world evolves. The Internet and new Web services standards will help us share and serve our knowledge and connect our individual efforts with GIS networks by providing the infrastructure for dealing with problems. This infrastructure consists of Web services with clients, servers, and portals that tell us where things are. Portals will organize our knowledge components and help us collaborate in ways we've not been able to in the past. We need to build the right culture for this. Certainly, our gathering together in July and talking about these concepts and our evolving GIS community are part of that. Is the vision of a distributed and collaborative GIS possible? Yes, I believe so. It's not only possible but also inevitable. All of the infrastructure technology is available. 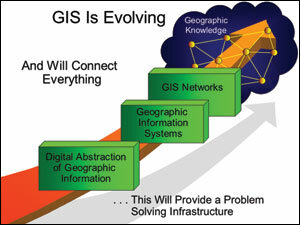 GIS software is maturing and spatial databases are increasing. Work flow and process models, data models, and map representations can now be abstracted in geodatabases. We are also seeing much more organizational and management support. Nevertheless, I think it's the GIS professionals who will ultimately be the key to bringing about this revolution. You will create the data, build the applications, evolve the organizations, support users, and manage the technical infrastructure. In the future, we are going to work more collaboratively, not just sharing data and working on a common project but also connecting and sharing the other GIS knowledge abstractions. This will be done on a global scale, and I believe future generations will benefit from your efforts. By creating, managing, and connecting your geographic contributions, I believe GIS professionals will serve the world. 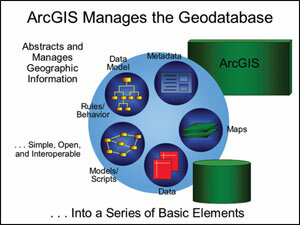 Starting about five years ago, Esri began developing the ArcGIS platform. 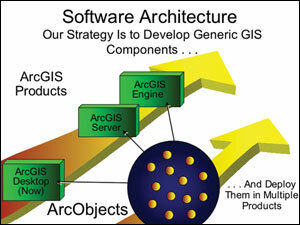 The fundamental vision of this platform was to reengineer all of the basic functionality of GIS into a new architecture comprised, in part, of a large generic GIS component library called ArcObjects. ArcObjects can now perform thousands of functions and has been and will continue to be extended by Esri's ongoing software development teams. To date, ArcObjects has principally been deployed in the ArcGIS Desktop family (ArcView, ArcEditor, ArcInfo, and their extensions). This year we'll be redeploying the same objects in a whole new GIS server architecture as well as fully exposing ArcObjects as developer technology in the form of engines. This software architecture and approach have not only allowed us to leverage our engineering, but they have also allowed our users to deploy GIS functionality (business logic) in servers, desktops, or custom clients wherever they need it. 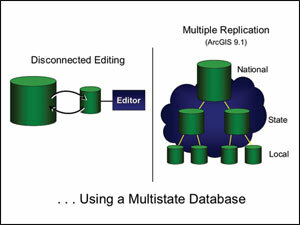 ArcGIS also manages a geodatabase. A geodatabase abstracts geographic information. It manages those five basic representations of geographic knowledge: maps and globes, geodata sets, work flow models, data models, and metadata. 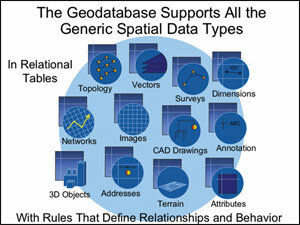 The geodatabase manages all of the different spatial types: vectors, rasters, and topology; networks; surveys; dimensions; CAD drawings; annotations; attributes; addresses; and three-dimensional objects such as buildings. These data types are managed with rules that define the relationships between and among them. These basic data sets are organized with data models. The geodatabase manages featuresbuildings, road names, parcels, etc., using thematic data models. They're real-world features that we can see on maps. These features point to generic data sets. 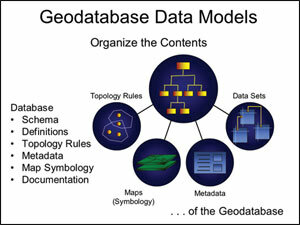 The geodatabase uses data models to define and organize data sets with schema, definitions, and topological rules. Data models organize the information and metadata that make up complex maps. 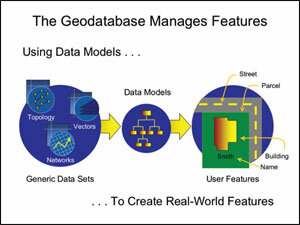 It's through data models that applications visualize and use data in the geodatabase. 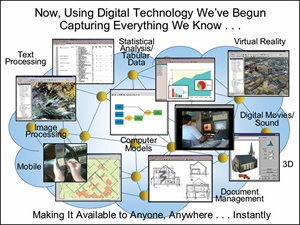 Developing thematic data models has been a focus of Esri for some time. Esri has been working collaboratively with many GIS professionals in various fields and has put millions of dollars into building a series of data model templates. There are data model templates for land records, utilities, topography mapping, the marine environment, hydrology, addressing, and many more. Each data model is built on common standards and encapsulates the expert knowledge of a field. These data models are not standards in and of themselves, but they do encapsulate standards. The Esri development models are freely available from support.esri.com/datamodels on the Web. You can download them, put them into the geodatabase, and jump-start your project. Data models have an important role because they are a way for GIS professionals to share and network. For example, if you see that a colleague in another state has used a data model successfully, you could determine that, perhaps with a slight adjustment, it may work for you as well. In other words, sharing data models is, in fact, a way of sharing the keys to organizing our world. The geodatabase manages change with versioning. This allows us to do long transactions, history tracking, and multiuser editing as well as distributed geographic data management. The first step was disconnected editing. We are now implementing distributed replications of the geodatabase at different locations, supporting the notion that different people/teams can work on the same layer at different locations and share the information using Internet technology. This is all done using versioning and a multistate database.